As the clock continues to tick on the NHL's preseason, Nikita Kucherov remains without a contract. One of the big questions for the Tampa Bay Lightning right now is who can and will step up to serve as a "replacement" for the dynamic Russian should the need arise. If preseason play is any indication, Brayden Point appears poised to do the job well. If the plan is for him to be up with the Lightning all year anyways, it just makes sense to slide him into Kucherov's spot until Kucherov signs on the dotted line, right? 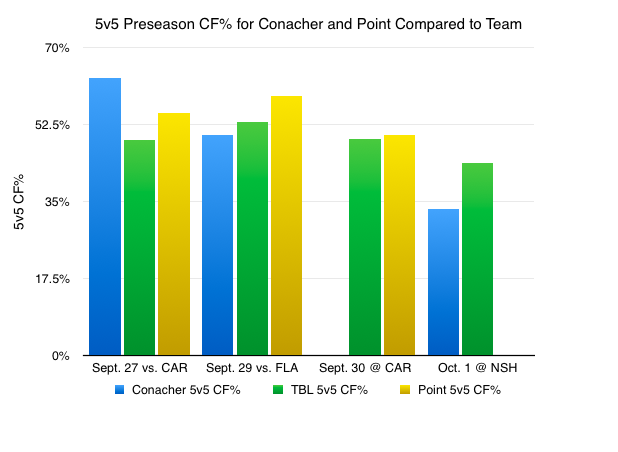 Even if Conacher isn't the offensive dynamo and everyday NHL player he appeared to be during his original stint with the Lightning, him taking a short-term tour of duty playing in a familiar top-six setting likely can't turn into a disaster. The trouble for Conacher, though, is that Brayden Point has come into camp and made a lot of noise. The team's undersized, third-round pick from the 2014 entry draft has done everything Coach Cooper & Co. could possibly want to see out of a young player trying to crack into the big league for the first time. If the Lightning want their operation to be a true meritocracy, it is Brayden Point rather than Conacher who should be sliding into Number-86's spot until a contract is finalized. The bottom line: Giving Point the extra minutes likely isn't difference between Conacher making the team or being cut. Rather, this is simply the difference between him playing down the lineup (say, as a Ryan Callahan replacement) and playing as a top-six forward as long as Kucherov is sitting out. Given that his career to date has shown that he likely won't be a top-six forward in the long-term, it's hard to argue against providing a taste of the opportunity to a guy (Point) who seemingly has the potential to be one. Combine the possession impact Point made with the fact that he's potted two preseason goals, and it becomes even more apparent that he at least deserves that chance to be "the guy" if Kucherov's absence is extended into the regular season. Consider the things that Kucherov does incredibly well: He's an elite scorer and he drives possession. While nobody is suggesting that Point can step in and be as good or effective as Kucherov, his preseason play has shown that he has the ability to both drive possession and be a goal scorer for this team. Beyond the short-term, what the team has seen from Point so far in 2016-17 has to be considered especially promising. To have a third-round pick with this much upside is nothing but a huge win. Whether Point can turn this preseason success into sustained success remains to be seen, but it's hard not to be excited about what the future holds for this player. Of course, depending on how things shake out with Nikita Kucherov, the future could start now.